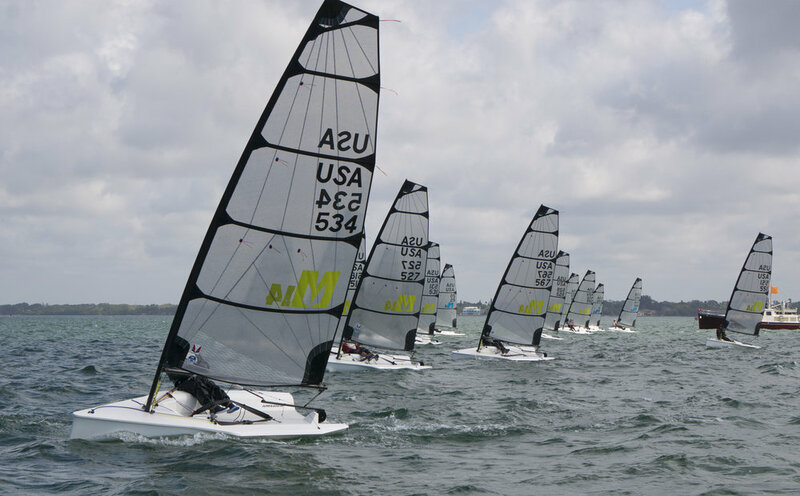 The regatta drew 25 sailors of all ages who enjoyed three days of warm, sunny Florida weather with wind varying from light to very heavy. With great sailing conditions in every wind range, everyone got a chance to see how fun the Melges 14 is. One race was sailed on the final day of the three-day event. The race started in wavy 11-14 mph conditions, built to 17-20 mph and gusted to 23. PRO Irene McNeill and the race committee team set a square starting line and a triangle windward leeward. Rogers punched out at the starboard end while Woodworth, Buckingham and Sean Fidler played the middle, and Bob Little won the pin end. Around the first windward mark, Woodworth held a 16 second lead on Buckingham. Behind them Fidler, Little, Rogers, and Dan Guildinger rounded within seconds. Chapman Peterson had an impressive downwind leg, picking off boats while sailing the Blue mid-range rig. Woodworth’s downwind maneuvering paid off again, and he extended his lead to one full minute by the time he reached the second windward mark rounding. Woodworth won the race, followed by Buckingham, Rogers, David Hillmyer, and Little. Breeze continued to build, so the race committee team called off racing for the day. On the way back to shore, Buckingham, Woodworth and Rogers lined up for speed testing. A few Melges 14 sailors sailed over to the Open Bic racecourse to cheer on their kids. Special thank you to Sarasota Sailing Squadron, the race committee team and Melges 14 dealers. Designed by Reichel/Pugh and built by Melges in Zenda, Wisconsin, USA, the Melges 14 is a modern one-design racing boat that also has the ability to sail with two people. The boat is 14 feet and features a large, open cockpit so no bailing is required. A carbon mast and boom complements its modern, flexible sail plan with three rigs: Gold (98 sq. ft.), Blue (85 sq. ft.), and Red (58 sq. ft.). Sailors can order a custom Melges 14 dolly, car top it or tow it behind any vehicle. Used as a beach boat, a family-style sailboat or a one-design racing platform, the Melges 14 was honored as Sailing World’s 2016 Boat of the Year – Best Dinghy. With fleets in North America, Europe, and Asia, the Melges 14 is emerging as a true high performance one-design racing boat, just two years after its introduction.